A version of this article appeared in the January 2013 print issue with the headline: The verdict is in. 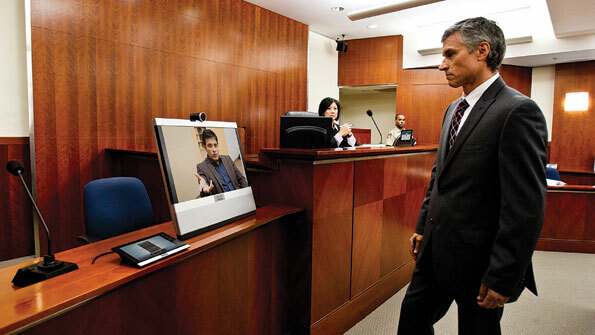 It is often said that the "wheels of justice grind slowly," but justice systems throughout the United States are discovering that proper use of video conferencing throughout the process — from courtrooms to corrections — can help dispense justice more quickly and at a significantly lower cost to taxpayers. In these locations, none of the key steps in the legal process are changed substantively, as arraignments, plea bargaining and trials all remain in place. However, these jurisdictions have learned that leveraging video can reduce — or eliminate — many of the hidden delays and costs of the legal system associated with logistics, such as travel time for a variety of participants, including witnesses, interpreters, attorneys and inmates. "It's the ability to take a system that is hundreds of years old and migrate portions of it to the Internet generation — and doing so in a manner that does not sacrifice quality," said Ron Schwarz, director of operations for Cisco Systems, a provider of video-conferencing solutions used in many criminal-justice environments. "Because, when you're dealing with public safety, you just can't do that. "The core tenet that they all share is that, in order to leverage video, they need to make it equivalent to a live interaction. What that means from a technical or network standpoint is that they need to initiate quality of service across the network, which is a mature technology, as well as the ability to have high-definition projections and receptions on the endpoints."